Ferdinand J. Kolb was born on October 17, 1847 at Erfeld, Neckar-Odenwald-Kreis, Baden-Württemberg, Germany. He was one of the ten children of Georg Valentin and Julianna (née Berberich) Kolb. Under the encouragment of his parents, Ferdinand decided early on entering the Roman Catholic priesthood. He was ordained at Louvaine (Leuven), Belgium on May 30, 1874. In 1874, Fr. 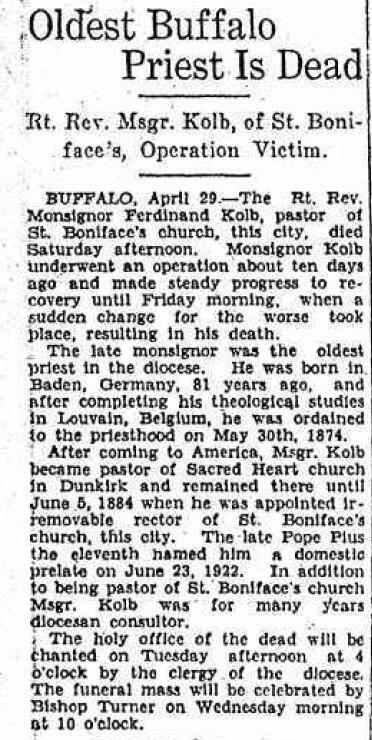 Kolb emigrated to the United States, where on November 4th he was made rector of the new independent parish of The Sacred Heart of Jesus in Dunkirk, NY. Fr. Kolb supervised the construction of a new church building, with the dedication of the Church of The Sacred Heart of Jesus occurring on November 18, 1877. On June 5, 1884, Bishop S.V. Ryan appointed Fr. 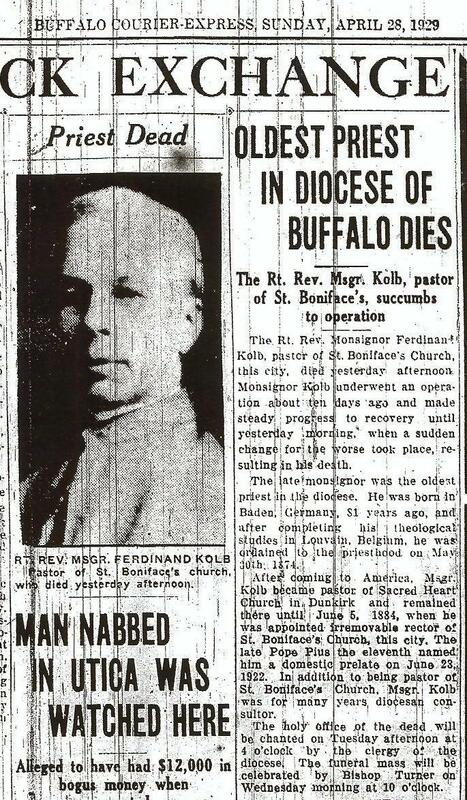 Kolb as irremovable rector of Saint Boniface R.C. Church, 124 Locust Street, Buffalo, NY. Under its previous pastor, Rev. Chrysostom Wagner, considerable turmoil had developed within the parish regarding a dispute over the number of trustees. On January 27th, Bishop Ryan had reassigned Rev. Wagner to the cathedral and ordered St. Boniface to be closed and interdicted (i.e. sacraments withdrawn). During his administration, Fr. Kolb reopened the parish and paid off the debts. He built a new brick convent for the Sisters (in 1888) at a cost of $10,000, and a brick school (in 1898) at a cost of $50,000. On June 23, 1922, Pope Pius the Eleventh named Rev. Kolb as domestic prelate. In addition to serving as pastor of St. Boniface, Msgr. Kolb served for many years as diocesan consultor. Msgr. Kolb died on April 27, 1929, at the age of 81, following complications due to surgery. A funeral mass was celebrated on by Bishop William Turner on May 1, 1929. He is interred in Section A, Lot 1, United German & French Cemetery (Pine Hill), Cheektowaga, NY. 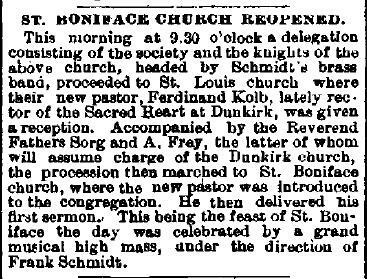 Newspaper Article: Reopening of Saint Boniface R.C. Church, June 5, 1884, with Rev. Ferdinand Kolb as new pastor. Published in the Buffalo Evening Republic, June 5, 1884. Newspaper Article: Describing an accident to Hattie Kolb, niece of Rev. 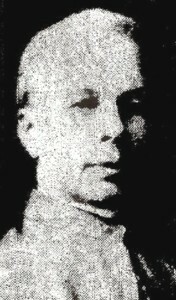 Ferdinand Kolb Published in the Syracuse Journal, September 9, 1903. Obituary: Msgr. Ferdinand Kolb, died April 27, 1929. Published in the Buffalo Courier Express, April 28, 1929. Obituary: Msgr. Ferdinand Kolb, died April 27, 1929. Published in the Niagara Falls Gazette, April 29, 1929. Obituary: Msgr. Ferdinand Kolb, died April 27, 1929. 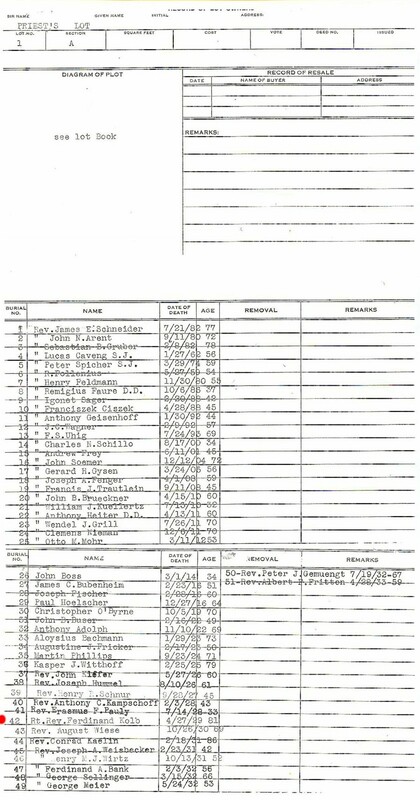 (Note error in date). 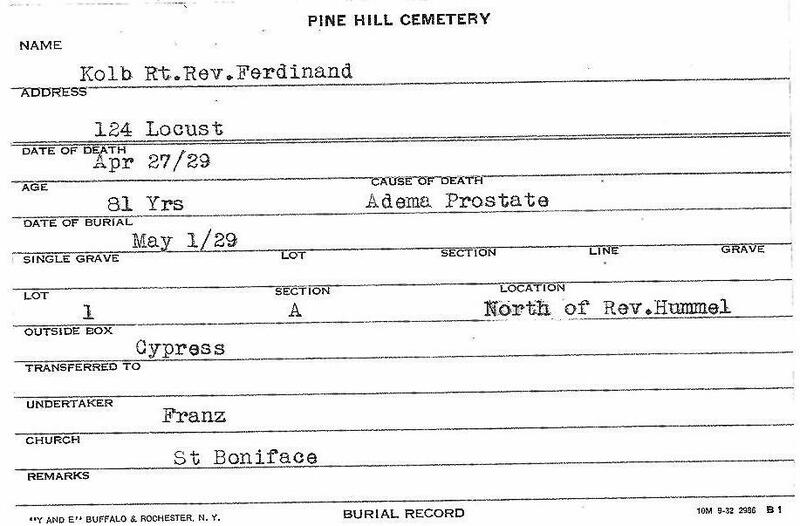 Interment Record: Msgr. Ferdinand Kolb, Section A, Lot 1, United German & French Cemetery (Pine Hill), Cheektowaga, NY.